A CAFE owner in the town where 5-year-old April Jones was abducted and murdered has defended putting up a sign featuring a joke about kidnapping. 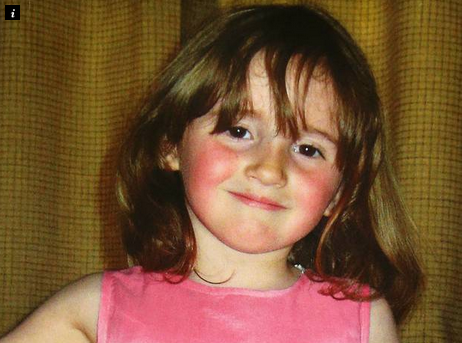 The disappearance of April Jones on 1 October 2012 sparked the biggest search operation in UK history. Mark Bridger was later sentenced to life imprisonment for snatching and murdering the child in a sexually motivated attack. Her remains have never been found, but traces of her blood and fragments of her skull were discovered in Bridger's cottage. The Chimes café in Machynlleth, Powys has now been forced to explain why a sign outside its store mentions kidnapping, after local resident Angharad Penrhyn tweeted a photo questioning it. The sign read: "The more you weigh, the harder you are to kidnap! Stay safe. Eat cake!!" Penrhyn said she was apparently told she was being "hypersensitive" about an incident which happened "years ago", when she complained about the sign. Responding to the complaint, the café owner claimed in an interview with the BBC that April Jones' family had visited the café but "have not said anything". She added that one person had complained over the notice which had apparently been on display for "many weeks", but admitted that she could see how others could take the message "the wrong way." The Independent has attempted to contact Chimes café for a comment.